70 percent of Korea is comprised of mountains, so it’s not surprising that hundreds of different kinds of edible plants, vegetables, mushrooms, and herbs are taken from the mountains and used in Korean cuisine. Many herbs are not only used for side dishes but medicine as well. After a long winter, when every creature comes alive again and flowers are blooming, all the wild vegetables start to come out also. Ssuk is one of the most widely-used wild vegetables in Korean cuisine, and it has many medicinal uses as well. 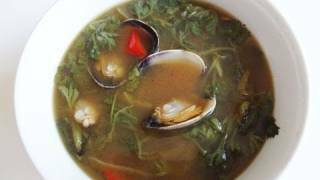 Young, tender mugwort leaves picked in the early spring are perfect time for mugwort soup. Place 12-13 small clams in a bowl. Add 1 cup of water and 1 ts salt and mix well. Soak for 1 hour to let the clams spit out any sand or mud. Put 6 cups of water into a pot. Add ½ cup’s worth of chopped onion (about ½ an onion) and 10 large dried anchovies (with guts and heads removed) to the pot. Boil for 20 minutes over high heat. Gently mix the mugwort with ¼ cup soy bean paste, 1 tbs flour, 3 cloves of minced garlic, and 2 tbs perilla seeds powder (optional). Strain the stock so it’s clear and a little brownish. Put it back in the pot and reheat it. Add the seasoned mugwort mixture to the boiling stock. Wash and drain the clams and put them into the soup. Cook 5-7 minutes more, then add chopped green or red chili pepper. My other mugwort recipe, mugwort rice cake (ssukbeomul) is here! Posted on Friday, April 8th, 2011 at 12:01 pm. Last updated on April 26, 2015. Posted May 3rd, 2014 at 7:30 am | Log in to reply. Maangchi, these are such surprising recipes for me! We have so much mugwort in our backyard, and we have tried for years to get rid of it. It’s a terrible weed for us. I wish I had many Korean neighbors who would like to pick and eat it in the spring. That would be a great help for us. Mugwort is very aggressive and very difficult to control. I will try your recipes and maybe that will make me appreciate this plant, which I haven’t liked at all until now. If you ever want to visit Pennsylvania at this time of year, I promise to give you as much mugwort as you could possibly want. Organically grown too! Posted May 4th, 2014 at 12:20 pm | Log in to reply. “We have tried for years to get rid of it.” I feel sorry for your mugwort! Did you know that mugwort also has medicinal uses? It’s also delicious and in the early spring is so tender than you can make soup, rice cake, or even pancakes with it. It gets tougher as it grows, but it can still be used. Cut and dry them, and hang them on the wall or put them in the living room in a basket. They will act as a natural air freshener. And whenever you take a bath, add some dried mugwort to the hot water in the tub. You will feel very refreshed. Posted May 8th, 2014 at 7:16 am | Log in to reply. Oh, Maangchi, you don’t need to feel sorry for our mugwort! It is definitely winning every battle. It grows so quickly that we cannot keep it out of the areas where we try to grow other vegetables. I did know of mugwort as a medicinal herb. I understood that it was not good for pregnant women, but otherwise good for women’s health. It does have a very nice smell. My husband has always disliked this plant too, but now he says he is willing to try the rice cake if I prepare it for him. I will let you know if I succeed. Maangchi, we are not so very far from NYC. I would be happy to bring you some mugwort in June. We are coming to the city just for the day on the 10th. There is a bus that leaves from right near our house and goes to Port Authority in less than 2 hours. You could also take the bus to visit us, see our large garden, and take home all the mugwort you could ever want! Posted April 19th, 2012 at 7:06 am | Log in to reply. For those of you who wants to plant mugwort, beware! After a lot of digging in the back yard because of renovation of my house, some dormant seeds of mugwort came up and grew. I did not know what they were. They were pretty, looking like chrysanthemum leaves. I let it grow, since I wanted to see the flowers. Wrong move! Pretty soon the whole back yard was full with mugworts, wall to wall. I used all kinds of ways to kill them, even all kinds of herbicides, including Round-up (5x) that a neighbor, who was working at a nursery then, prayed them for me. Then the family moved, the mugworts still in my back yard. Finally I looked in the Internet, and found Lontrel, that unfortunately a non professional cannot buy. The smallest size was a quart bottle. It cost $120.00 at that time. I bought it through my rose club that I belong to. I wore goggles, protective herbicide clothing that covered me from head to toes, mask for my breathing, and armed with a prayer I carefully sprayed the leaves very early in the morning, when it was not windy, careful not to spray the soil, since I did not want to contaminate my soil. It worked. The next year the mugwort did not come up, their roots were black. Mugwort has very long soft roots. If you break them, more plants grow. So beware. They are all over the place, I went to China last year, I saw them there too. I did not know I could have harvested them and eat them!–Missed my chance, but no, thank you, I am NOT growing them again. Sometimes a few come up again, and I immediately pull them, including the roots. Posted April 19th, 2012 at 2:04 pm | Log in to reply. Yes, ssuk is very strong… My reader Ina is growing ssuk in her garden. I hope she is ok with her ssuk. Posted April 17th, 2012 at 5:30 am | Log in to reply. Posted April 19th, 2012 at 2:05 pm | Log in to reply. ; ) delicious soup! I kept saying “delicious, delicious, good flavor” while I was eating the soup. Posted April 14th, 2011 at 2:23 am | Log in to reply. Oh Maangchi… In New Zealand our seasons are opposite to yours. I’m always sad to wait 6 months to try the seasonal recipes. Question: How is mungwort used in traditional Korean medicine? What are the traditional health benefits? Posted April 15th, 2011 at 10:11 am | Log in to reply. Posted April 15th, 2011 at 11:29 pm | Log in to reply. Any entertaining stories along these lines? Hahaha. Thanks for sharing your knowledge and traditions with the world. You’re an inspiration. Posted April 15th, 2011 at 11:32 pm | Log in to reply. Posted April 12th, 2011 at 5:10 pm | Log in to reply. Would substituting chicken be just as delicious? 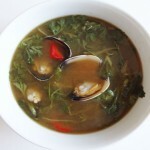 My daughter has a shellfish allergy (not to fish though) and loves when I make korean soups for her. Posted April 12th, 2011 at 4:35 pm | Log in to reply. Now I want to know if this plant grows in the wild here in Holland or not ! I love collecting wild plants, fruits and nuts. It’s natural, fun to do and it’s free ! Posted April 11th, 2011 at 9:45 am | Log in to reply. Posted April 12th, 2011 at 9:59 am | Log in to reply. I didn’t know you could buy mugwort seeds! Posted April 12th, 2011 at 10:31 pm | Log in to reply. Posted April 17th, 2011 at 10:02 pm | Log in to reply. I use Kitazawa seeds. They are very good quality. I have had excellent luck with kkaennip seeds. Posted April 10th, 2011 at 9:54 pm | Log in to reply. Hi Maangchi. I have a comment/question from my mother. She is asking why you don’t use the heads of the dried anchovies? She said that there is so much flavour in the head and cheeks that you should be using that as well. Any comments? Posted April 11th, 2011 at 10:24 am | Log in to reply. I think she does use the heads– you can see them in the video here when she’s making stock. She just removes the guts. Posted April 11th, 2011 at 6:54 pm | Log in to reply. You are so right. It was an oversight on our part. Thank you. Posted April 8th, 2011 at 3:47 pm | Log in to reply. The soup looks so satisfying! I will have to try it with store-bought mugwort until I get comfortable picking my own. But I love that you got your mugwort and wild onions straight from mother nature! What a great way to celebrate spring. Posted April 9th, 2011 at 8:45 am | Log in to reply. Posted April 8th, 2011 at 2:32 pm | Log in to reply. yum maangchi! thank you for sharing. btw, did you know that you can get clams clean using cornmeal? i live in the pacific northwest and go clam digging a lot. we put about 1/2 c of cornmeal in water w/the clams and it helps flush out all the sand and grit from the shells. i hope this helps. happy cooking! Posted April 9th, 2011 at 8:49 am | Log in to reply. Thank you for the tip! I should try it. Posted April 8th, 2011 at 1:47 pm | Log in to reply. WOW looks very tasty might try that !! This recipe was originally posted on April 8, 2011 at 12:01 pm by Maangchi. It was last updated on April 26, 2015. The video was watched 139,474 times on YouTube & has 1,016 likes!